One of the best games, ever. Comments: The first full 3D space combat game, Star Raiders is a real–time 3D version of Star Trek. Excited by the success of the home computer market, in the late 70’s Atari started work on their design that would be released as the 400 and 800 “Personal Computer Systems”. This started a long —sometimes glorious, sometimes sad— history of computing at Atari. The Atari’s were ‘2nd generation’ home computers when compared to their earlier counterparts like the Apple II and S–100 machines. They were roughly twice as fast as anything else, built like tanks, included a flexible OS (by the standards of the era), and provided all I/O in the form of a single daisy-chainable port. Ahh the 8-bitters. So much promise, wasted. But some features of the machines belie their origin as game consoles designed to replace the famous 2600 (a.k.a. VCS). They included four ports for game controllers and sported a selection of function keys for controlling games — Start, Option and Select. And as you’d expect from a game machine, they had excellent graphics and sound. In order to get this sort of feature set out of what was a rather basic CPU, the machines used a variety of custom built add-on chips. Primary among these was the ANTIC, which provided a tremendous leap forward in display tech for the day. Another one of the custom chips in the Atari was the POKEY —which stood for “POts and KEYs”— and as the name implies it was a controller for basic I/O. The POKEY contained a number of timers for handling the controller and ports, and working “in reverse” the timers could be use to generate sound. Where most machines had no sound or a tiny “beeper”, the Atari had four controllable voices with a variety of effects. A combination of POKEYs were often used in later Atari arcade games, generating the wonderful stereo sound in Star Wars for instance. One of the principle designers of the POKEY was Doug Neubauer, who formerly worked on National Semiconductor’s abortive home-computer project. While the Atari was coming together in 1979, Doug started working on a great bit of demoware to show it off. His path appears to follow the same sort of pattern that led to Spacewar: here’s an amazing new machine, let’s write something to show off everything it can do. 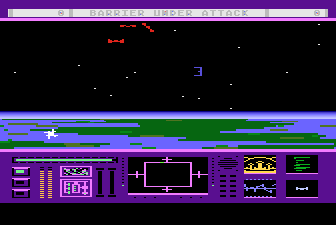 The game itself drew its inspiration from the Star Trek games he had played on mainframes, but taken to its logical extreme in terms of interface and gameplay. Working in his spare time and playtesting with fellow employees during lunch, Doug was able to get the game out for the launch of the machines, and has the distinction of having the first game on the platform. Sadly software licensing was different in those days, and he didn’t make a penny off the game. Doug left Atari for HP shortly after Star Raiders was released. The game was an instant success. It was far more advanced than any game at the time, including the newest machines in the arcades. It’s was the killer product for the Atari. There were a huge number of people who plunked down the cash for one after seeing the game at a local store. I clearly remember the first time I saw it; I was at a store set up in an industrial mall in Toronto with my friend Charles, and when we walked out I said “that’s the best game I’ve ever seen”. Star Raiders was so successful that Atari attempted various spin-offs. One of the earliest was a graphically poor, but still fun, version for the 2600. The VCS was equipped only with joysticks and paddle controllers, so the game had to ship with small keypad controllers for controlling the game’s functions. Years later a version was shipped for the ST with some changes, but it was somehow ruined — it looked great but it was boring to play. Solaris was a pseudo-3D game, but it worked great. Doug Neubauer went on to design or program a number of 2600 games published by 20th Century Fox, and released a few more through Atari as a 3rd party developer. His next big hit was Solaris for the 2600. 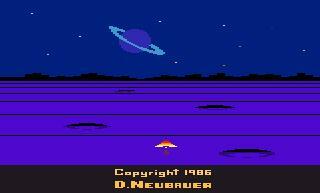 It was similar to Star Raiders in some ways, but it was an isometric game instead of 3D, and took place in a much bigger universe with a more grandious mission to complete as you attempt to find the planet of Solaris. Around the same time Solaris was becoming a hit, Atari was attempting a grand tie–in with the movie The Last Starfigher (“Seen the movie? Now play the game!”). The “plot” revolves around aliens who drop arcade games on Earth, looking for the people with the best hand/eye coordination to become fighter pilots. Anyhoo, the movie includes several scenes of said arcade game, and Atari was hoping to cash in by producing a version that would be available only on their computers. Star Raiders II was just different. It had its points, but it simply wasn’t anything like the original. As it turned out the game was no great shakes. So as the story goes, Atari flew Doug down to view The Last Starfighter (the game) in 1984, apparently to discuss using Solaris as The Last Starfighter. But Atari was in big trouble at the time, and the company fell apart over the next few months. Probably no loss there, considering that the movie was a complete flop. Then in an odd turn of events, The Last Starfighter was finally released well after the movie was gone from the theaters. Since a tie-in with the movie was now pointless, it was edited a bit and was released as Star Raiders II, a tie in to the original game instead! It did have some interesting points, and I enjoying playing it, but it was certainly not as in-your-face as Star Raiders. Years later people still talk about Star Raiders with fondness. The game was essentially a 3D version of Star Trek, and Star Trek was great for its day I suppose, but let’s face it, the real fun of it was that it was on a computer. Not so with Star Raiders! We’re talking hour on hour, late into the night, hand hurting, firing thumb aching, frenzied action. This is one of those games were the gameplay was simply out of the world. If you ever get a chance to play it, give it a try, it stacks up even now 20 years later. Synopsis: Pilot your fighter around the galaxy and take on an invading force of Zylons. As you might expect from a game based on Star Trek, the aim of Star Raiders is to track down and destroy a number of marauding enemy ships in your sector of space. The main changes in story are that you fought for the “Atarian Federation” and you’re fighting the “Zylon Empire”. Unlike Star Trek which ended after a timed deadline, here the game ends when the Zylon’s manage to destroy all of your starbases. You spend a lot of time in this view. Two enemy ships are attacking your fighter, and one of them has just hit your shields (the green sparks). The targeting computer in the lower right has locked onto the ship near the crosshairs, so your return fire (pink) will track that ship. If you were around in the early 80’s, the first time you started up the game, your jaw dropped. Here you were sitting in a ship looking out the front window as it moved through space. Stars moved past your ship as if you were sitting on the bridge of the Enterprise looking at the viewscreen. For people who had seen nothing but 2D side–scrollers this was just out of the world. The ship flew like you expected it to. As you moved the stick around you could ‘feel’ the ship changing direction by the way the starfield moved. It just felt right. The display was crisp even on a TV, due to the machines excellent display hardware. It was also functional, just a large central viewscreen with a few instruments surrounding it and a nice big crosshairs in the middle. The Galactic Chart is Star Raider’s version of the Long Range Scan in Star Trek. The asterisks are star bases, while other icons reveal the number of enemy ships in that sector. For some reason, the fighter icons mean “two”. Starting off is easy enough, after selecting a difficulty level with the Select key and then pressing Start, you can bring up the graphical version of Star Trek’s Long Range Scan by pressing G on the keyboard. The map is 16×8 sectors, twice as large as the original in Star Trek but otherwise similar. The symbols on the map show your starbases (the asterixes) and the enemy ships — stars are not important in this game. Enemy ships show up as a number of different icons. The one that looks like a spaceship pointing to the right means there are one or two enemies in that quadrant, the others can be counted by the number of dots. The difference in the iconography here has always mystified me, I think he was being slightly lazy and simply re–using an icon you’ll see later. The small groups are “patrols”, the groups of three are a “task force” and four are a “fleet”. This is actually an important distinction in the game. Your ship shows up as a small blinking pink dot. By moving the joystick another dot moves around the display, and by moving this dot to other sectors you set your destination for warp travel. Pressing H at that point starts you warping to that sector, complete with a Star Wars style ‘flying stars’ display. When inside a sector there’s no real movement, you can’t fly from sector to sector without warping. That said, the enemy ships fly at a set speed, so you can turn on your own ‘ion engines’ in order to even out the relative speeds between your ships. If you don’t, the enemy ships go whipping past you in strafing runs and it’s hard to draw a bead on them. Once you found the enemy ships within a sector, the fun started. Each ship had it’s own style of combat and when they were combined it made combat difficult. Some would come in in straffing runs, forcing you to move about to try to get a shot at them, while others ‘stood off’ at longer ranges and sort of bombed you. Every player had their own strategy for dealing with the ships. To help you track them down the ship had a targeting computer which could be locked on to the nearest enemy ship and followed it. It displayed it’s relative position in two ways, a series of numbers across the bottom of the screen showing angles and distances, as well as the graphical display shown above. The enemy had three types of ships, and not only did they fight differently, but they decided to fight differently. Fighters would typically start to attack you as soon as you entered the sector, cruisers and basestars (which had shields which made them hard to kill except at close range) would ignore you. Both you and the enemy ships had the same weapons, photon torpedoes, which looked great in the game, sort of staticy balls that flew out making a great ‘pewww’ sound. The not-so-useful Long Range Scan, typically only used to hunt down star bases. At novice level all of the ships would come at you, but at higher levels it was up to you to go out and hunt them down. To help you find them Star Raiders included its own version of Star Trek’s Short Range Scan, although in this case it was called “Long Range Scan”. This displayed a top–down view of the space around your ship, it showed a fake starfield and the enemy ships could be seen flying about. Essentially it was a 360 degree radar with your ship in the middle. Oddly the starfield was 2D, pulling up on the stick rotated it and you’d see it was a flat disk. To protect yourself from the Zylon hits, and the occasional floating asteroid, your ship was equipped with shields. When they were turned on the screen would change to a light bluish background. At lower levels they were invulnerable, but as the skill level went up you would take damage even with the shields turned on. Without shields, even a single hit kills you. Repair ship on the way! In addition your engines and warp drive use up energy, the former based on speed and the later on distance. Your ship starts with 9999 units of energy, which you can refill by docking with a starbase. The enemy fleets had a chance to move every 30 seconds of real time. The patrol groups could move every 30 seconds, the tasks forces only on the minutes, and the fleets every 2 minutes. So it was important to take out the patrols first, which would leave you breathing room to take out the rest of the ships at a more leisurely pace. The game starts with the enemy ships scattered about the map randomly. The Zylons would pick one of your starbases and start closing in on it. When a starbase is surrounded on three (of eight) sides, it’s under attack, and you have one minute to save it by destroying enough of the surrounding fleets. If you don’t the starbase will be destroyed, and two new enemy ships will be created out of the debris. One trick was that when you started a new game, you wanted a map where (by chance) 4 of your bases were in a diamond formation and you kept restarting the game until the map gave you one of these. That way you could protect all 4 just by protecting the central sector. One rare event that was quite interesting involved the destruction of your base in those few seconds while the repair ship was en route to your ship. The orphaned repair ship would wander sadly through space, and you could follow it while fending off the Zylons that had destroyed the base. Though the Zylons never paid any attention to the repair ship, and I always thought it was unfortunate that the repair ship would abort its mission to help you if the base was destroyed. Damage was interesting simply because of the graphical nature of the game. Watching your shields flicker on and off was enough to make your heart stop. Worse was when you completely lost your engines and were trying to make it to a starbase for repair, that meant flicking your hyperdrive on and off while you tried to track down the starbase — with your broken LRS which showed you flashing mirror images of everything! Advancing the skill level made the game harder in a number of ways. Like Star Trek it changed the numbers of bases and enemy ships (or groups of them in this case), but in Star Raiders the number of bases also increased. This gave both you and the enemy an advantage; you had more places to refuel, but they had more places to attack. The shields would stop making you invulnerable, and hits would do more damage at higher levels. The enemy ships also became more interested in attacking the bases and less interested in you, this made the game much harder because you had to spend a lot of time hunting them down instead of just waiting for them to attack. Finally the game made hyperspace jumps “manual” at higher levels, requiring you to keep the ship flying in the direction of a pipper while it moved about randomly. The challenging thing was that the joystick control was inverted, which means you had to move the joystick down to move the crosshairs up, right for left, etc. I recall watching a documentary about the Concorde years later, and how one of the tests they had for potential pilots was to do precisely this — keep crosshairs centred on a screen with the controls reversed! This was quite hard to control and even minor problems in guidance could leave you in the wrong quadrant. Sadly this effect wasn’t based on distance. If you missed by a little bit, say to the right, you ended up one sector to the right whether you were jumping one sector or ten. If you weren’t very good with the reverse controls, you could spend a lot of time “hunting” in circles around the sector you wanted to fly to. When deciding to go to another sector with hyperspace, the placement of your target in the sector actually mattered. If you put it in the corner and didn’t deviate, you ended up in the far corner and had to waste fuel finding the enemy (or more importantly, your own base for repair). So, you always wanted to go dead–center of the sector. The attention to such detail in the game was what added to its appeal. And you would only advance towards a Zylon until you could see them in the distance — at that point they would approach you (usually!) and you could save your energy. Now, a lot of how they reacted to you depended on where in the sector you ended up after the warp. The Galactic Chart would show the exact position within a sector your ship warped to. I found that the closer to the middle of the sector you ended up, it was almost like landing right in the middle of the Zylons, they would usually attack right away (a zylon will _always_ attack when it gets within 120 centrons of your ship). If you landed in the outer fringes of the sector, they would tend to ignore you more or even ‘bait’ you, fly somewhat close, then zoom away. It was actually a very interesting AI tactic that Doug implemented. It forced you to to try to warp to the center of a sector as often as possible, it made the hyperwarp flight kind of a game within the game. If you landed on the edge of a sector, it took more time and energy (both of which count against your score) to track down and clear a sector. Not to mention the Zylon behavior could been seen as a ‘delaying’ tactic, by avoiding you, it took more time hunting them down, so the other patrols had more time to surround the other starbases. This game always amazed me at the number of intricate little strategies that Doug stuffed into an 8k game, it was a brilliant design. When the game ends, either with all of the enemy ships or your starbases destroyed, you are assigned a rank based on your score. This was one of the highlights of the game, your rank could be anything from “Garbage Scow Captain” if you did very poorly, all the way up to “Star Commander”. In addition each rank added a Class from 1 (lowest) to 4 (highest). Getting Star Commander Class 4 was incredibly difficult. Your final score was based on a lot of factors, mainly the number of bases lost, time to completion, and energy used. Considering that, some of the other tricks were to turn off shields during hyperspace or basically any time not in a battle. The drawback of that was coming out of hyperspace and having that fluke asteroid smash you to bits the instant you arrive. Having any base destroyed would eliminate any chance for a good rank at the end of the game. I recall getting rankings ranging from “Garbage Scow Captain” for intentionally blowing up all my own repair ships and bases; right up to “Star Commander Class 4” for finishing the game in probably less than ten minutes and only using shields for a few moments during battles. Star Raiders Tribute Page is Bill Kendrick’s great fan page for the game, including a couple of movies. An interview from 1986 with Doug Neubauer can be found at the Atari HQ. Doug has his own page up here, but there’s not much on it about Star Raiders. A lot of the play details and tricks come from my long time friend, Oliver Kenkel. Other tips and help on various article items are from Dave Webster, who also helped out on the SunDog article. Most of the pictures above were taken with permission from from Bill’s fan page above. The pictures have a greenish tint to them, this is a side effect of the funky palette in the emulator used to take these screen snaps. The sky should be a dark blue tint, a result of having the shields turned on. Karl Morris for the picture of the Atari 400/800 systems, from his page Atari Explorer (formerly the Atari Time Machine).